Gift your little joy of bundle this classy set and keep him entertained all day long. 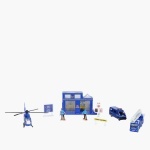 This set is inclusive of a police station, figurines of police, helicopter, vans, etc. that are designed with sharp detailing for fine and realistic looks.